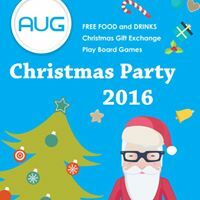 Hello all AUG+ Members and AUG Students, if you are still in Brisbane for your Christmas Holiday, you are invited to AUG+ Christmas Party, to celebrate with our lovely AUG Friends and Families. If you would like to join us, please click: https://goo.gl/forms/o2FhtEHEEKEDCvxt1 to RSVP. Details: Each member allows to bring ONE friend along. Each attendance should bring a gift between $10 to $20 to participate the Gift Exchange.